i turned thirty in september. here are my thoughts on the matter. + now that i'm thirty i know better; life goes on after high school, toddlers are way more awesome than i once imagined. marriage is much better than dating. fresh minced garlic is good sauteed with almost anything. surprises are still super fun. you never get sick of balloons. or confetti. or handwritten letters. or bananas with peanut butter. + now that i'm thirty i ought to have a regular bedtime. + now that i'm thirty i thought i would've outgrown sugar cereals by now. + now that i'm thirty paying more for fine dining, lush stationery, crusty bread straight from a bakery shop or having an expert vacuum out the car are luxuries i'll never take for granted. + now that i'm thirty i am sinking into who i am and what i stand for. + now that i'm thirty i want to write my stories down for safekeeping. i am realizing more and more how important our personal stories are. whenever i sit down with my parents, dan's parents or his grandma bernice and listen to their tales, i want to wrap the feelings i have up in a linen box and save it for generations to come. + now that i'm thirty i am excited about planning kid parties which is lots less stress than planning a wedding. + now that i'm thirty i should have a boatload of good books to recommend at book club. + now that i'm thirty i shouldn't be fearful to raise my hand. in any situation. + now that i'm thirty i count my blessings; so many people are suffering hardships like disease, death, depression and divorce. i feel unbelievably lucky. + now that i'm thirty i've mastered the art of cleaning out my fridge (tossing unidentifiable leftovers), figuring out how to hook-up the internet, get stains out, organize important paperwork, know where our passports are (at all times), book a flight, paint my nails without a smudge, juggle a baby, a cell phone and a pot of pasta at once among other fine things that come with being a housewife. + now that i'm thirty i should write letters to the teachers of my past; ones i think of often and appreciate. + now that i'm thirty i understand a wee bit more that we are not in control of what happens to us or our loved ones. we are only in control of how we react on the road we are traveling. + now that i'm thirty i think i ought to have a few recipes memorized. and some poetry. (and my mom's new phone number!) just to have on hand / in mind. + now that i'm thirty i wish i were better at giving directions. i'm horrible at it! + now that i'm thirty i need to start acting more like a woman. more thank you notes and kindly deeds. more lipstick and heels. and good haircuts. and making soup for the sick and holding doors and visiting the elderly and looking semi-presentable by noon. + now that i'm thirty i should start embracing the fact that this blog is more writerly than anything else. and i shouldn't be shy about mentioning it; but admittedly it's a funny topic of conversation to someone you've just met. usually i just let them discover it about me along the way. what about you? when do you tell someone you have a blog? it's a little like unveiling a hidden tattoo. + now that i'm thirty i should have a list of real favorites. nine year olds are pretty solid in their favorites. we'll see if i can patch an updated list together. + now that i'm thirty i am super glad i never got any random piercings. + now that i'm thirty i ought to acquire a legit coffee table. with glossy coffee table books. + now that i'm thirty i've embraced the concept of the purse. whole-heartedly. + now that i'm thirty i am cool with being short. still not so cool with my cankles. + now that i'm thirty i wish i had been a better friend. i was a drama queen when i was on the playground. + now that i'm thirty i am grateful with my travelogue thus far and can't wait for the time to come to introduce my kids to the world with dan by my side. + now that i'm thirty i've stopped looking for facial cleansers; cetaphil pretty much does the job. + now that i'm thirty i ought to quit thinking i was just in high school. it was indeed awhile ago; i just can't believe i pass as a grown up now. + now that i'm thirty i'm so glad i took creative writing in middle school, cub chorus in elementary school, public speaking in high school and photoshop in college. i use what i learned in those classes every single day. + now that i'm thirty i wonder what the next thirty years have in store. lovely. i'll be 30 in april. i think the combination of turning 30 and becoming a mom has led to so many epiphanies these last few years. i think to myself, shouldn't i be wearing more dresses? more skirts and heels? (i smiled when i saw this on your list.) shouldn't i be wearing more lipstick? taking more initiative when it comes to helping others in my community? I don't use facebook. I had it for a while and it was very time consuming, but it was all trivial surface level things. No real conversation and it made myself and other friends complacent about actually meeting face to face and planning proper time together. My boyfriend got rid of his after he realised it took him ten minutes to figure out who someone was (an old work colleague) and why his information was coming up on his feed. That was a year ago, neither of us miss it. well done as always! can't wait for...."now that i'm thirty i should have a list of real favorites. nine year olds are pretty solid in their favorites. we'll see if i can patch an updated list together." Fantastic my dear. I don't think there is a day that goes by that I don't think, "I'm thirty years old now. I should be able to, blah, blah, blah." I agree it feels quite liberating. love this post. i don't think we ever grow too old for sugary, sweet cereals- they help us stay young! :) and a favorites list is always a hard thing for me to come up with as well! i'd be interested to hear your books you recommend, are you on goodreads?? I love this! I'm turning 30 in November and I've got a 30 list going. One of mine was to write 30 great people in my life a handwritten letter. Among them were great church leaders and a favorite teacher. I couldn't help feel so LUCKY to have so many great people help mold me during these short 30 years. And Cruella is the best color around. I love that handy little crayon. It's the best two-fer (lipstick/liner) around! I turn 29 in April and lists from wise ladies like you telling about how awesome 30 makes me feel hopeful instead of anxious. Love this. Happy weekend! 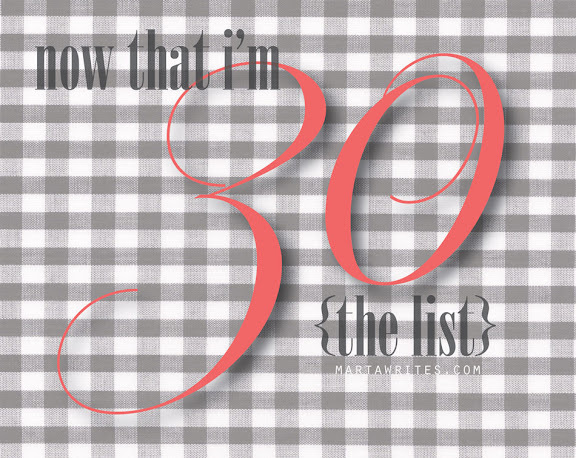 I just turned 30 this month, and I couldn't help but laugh at how many of the things on your list I agreed with. I kept shouting out, "Me too!" much to the confusion of my coworkers. Great list. I don't turn 30 until next year (and I don't turn 29 till April), but I am so looking forward to it. I know it sounds totally strange, but I'm over being in my twenties and ready to move on. As for FB. I've decided not to use it for my little Etsy shop. It's just one more thing to keep track of but I do use it for personal reasons. About 3/4 of my "friends" are actually family that's spread out all over the world. It's a nice way to keep in touch with everyone. Well, I turned 30 a while ago and somehow I thought when I was 30 I might actually feel like a grown up (I still don't). I just mentioned to my husband the other day that I never would have dreampt at 34 I'd still be picking extra marshmallows out of the box for my bowl of Lucky charms. loved this list. the counting blessings bit was an amen for me. and the cankles cracked me up! happy year of 30. it was a fantastic, growth-inducing year for me. fingers crossed 31 is just as wonderful. 30's have been wonderful. It's the time to settle into who you are and enjoy life a bit more. I can totally relate to all of this. I'm 31 and still surprised I pass as a grown-up. Lately, I just want to feel like a WOMAN...like you said... lipstick and heels. dear marta, i love you. well the girl i know from your blog, who i'm guessing is pretty much just you. so thanks for writing a great blog. and thanks for being someone who inspires me to be better. And to chime in on the facebook stuff - I like having facebook for the fun stuff of seeing people's pictures and having a way to quickly check in and say hey. But, I'm realizing that more and more I get sick of reading the negativity that is constantly showing up in my newsfeed (posts that I have nothing to do with, I just happen to be friends with someone who posted it or even just commented on it). I'm hiding more and more posts and considering taking a step back from it at this point. So if you are wavering, I'd say keep "using your energy elsewhere" and don't worry about it. Love this post, I turn 29 in a week & I still love sugary cereal. And if it's in the house I will still eat it for lunch. But somethings I don't want to grow out of! terrified of turning 30 this year. you make it sound much more appealing. these writing posts are my fav. i really loved this post, and smiled when i read so many of the thoughts because i could identify;) i am going to have to show my husband the one about bananas and peanut butter - he thinks i am the only person on the planet who likes that combo. maybe i will get a new lipstick (instead of my chapstick) to put on before i tell him;) thanks for the great way to start my day. A friend at work says: "Facebook is where you share the stupidest things with the people closest to you, and Twitter is where you share your most professional, awesome stuff with people you hardly know." I agree with him. I am a HUGE fan of Twitter for business purposes, and manage my company's handle. Are you on Twitter, Marta? My handle is @Crystaleelee and I would love to follow you if you are! Okay, so many times I think after reading your posts, "wow, that was one of her best ever!" Of course this one is filed in that category as well. So brilliant and what a great idea! You have such a authentic voice, I love it. Keep up the amazing posts Mart! PS-Love that you're rockin' a red lip, you know I'm a fan!! honestly, i have missed you! your writing, choice of words and impeccable taste never stops amazing me! you're a knock out! i have many favorite posts of yours, but this one is my favorite !! am totally in love with this list, marta. it's beautiful! 1. Telling people you have a blog is indeed super awkward. I actually prefer having strangers stumble across my blog on accident than telling people I know personally to check it out. Why IS this? Your work is always fun to read; thanks for sharing! Also, this post came up in my reader today, and I thought of your comment in the post above. I, too, love cetaphil, but I thought you might find it interesting. Such an amazing list. I was gobbling it up. My eyes couldn't keep up with my excitement in aggreeing with every one of the bullets. I'm almost at the 30 mark & now I couldn't be more excited! love every bit of this. it is great being a woman, isn't it? will be thinking of this and raising my hand more often.